Australia's ruthless demolition of England on the second day of the first Test was the culmination of all the animosity and ill-feeling that has been building up towards the tourists. 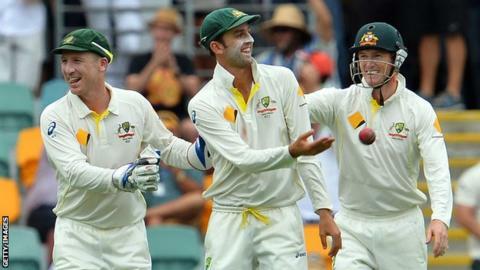 After their 3-0 Ashes defeat in England over the summer, Australia were desperate for revenge. They were always going to come at England like a bull from a gate and that is exactly what happened today. As England crumbled from 82-2 to 136 all out in reply to Australia's 295 in Brisbane, you could feel the electricity and hostility in the air. This was payback time and every Australian in the Gabba was loving every minute of it. The leader of the assault was Mitchell Johnson, who thundered in for one of the most aggressive spells of fast bowling I have seen for some time. His bowling, especially towards England's tail-enders, was of such pace and brutality that it made you grateful to be in the sanctuary of the commentary box. The dismissal of Michael Carberry was the result of excellent planning and outstanding execution. From around the wicket, he bowled three fizzing short balls to him and then a fuller one on off-stump that the Hampshire opener nicked to slip. "What will concern Alastair Cook and his England team as much as this sudden tornado is that, while the magnitude of this collapse is unprecedented for this group of players, the problems in their batting are increasingly deep-rooted." But aside from Carberry, who until that point had coped admirably to score 40 on his Ashes debut, England's batsmen played a significant part in their own downfalls in a calamitous display that evoked memories of some of the crazy collapses of the 1990s. Kevin Pietersen looked comfortable before he wastefully flicked to mid-wicket, while Joe Root had a firm-footed drive at a wide one and edged to third slip. But it was the soft dismissals of Ian Bell and Matt Prior, who were both caught at short-leg from successive balls from Nathan Lyon, that were particularly alarming. It is difficult to criticise Bell after his three magnificent centuries did so much to help England retain the urn in the summer, but he will be furious with himself for having succumbed so tamely to an off-spinner on the second day of a Test match on a pretty flat pitch. For Prior, meanwhile, it is the continuation of a worrying run of form with the bat as he was out to his first ball for the third time this year. England's paltry total was hardly a surprise given that they have now failed to score 200 in any of their first innings in their last five away series. Whether it has something to do with the quality of their preparation, or a struggle to switch on mentally to the demands of Test cricket so early in a tour, something is going wrong and England have to find a solution. After rolling England over, Australia reached 65-0, a lead of 224, to leave England needing a miracle far beyond the one that saved them in 2010. Then, they made 517-1 in their second innings, thanks to centuries from Andrew Strauss and Jonathan Trott - and a double ton from Alastair Cook. Michael Clarke will be mindful of the resistance England put up three years ago but he will take the view that lightning won't strike twice. He will look to bat the tourists out of the game tomorrow, before going on the attack in England's second innings. Although it was a disappointing day for England, Australia's performance has really brought the series to life. I hope the short-pitched bowling is controlled by the umpires because you don't want to see people getting hurt, but the level of intensity and aggression we saw from Johnson today is one of the most exciting sights in Test cricket. If Australia can keep this up, we could be in for a magnificent series. For a gallery of images from the second day's play go to the BBC Sport Facebook page.